Globalization is having a dramatic effect on income distribution around the world as I discussed in a previous post. Middle incomes in the developed world are stagnating while at the same time they are growing rapidly throughout much of the rest of the world. At the same time as western world economies are stagnating, turmoil and instability are breaking out elsewhere, especially in eastern Europe, the Middle East and northern Africa. Fortunately the U.S. and its allies are stepping in with military force to help maintain local order in many parts of the world where it is breaking down. In short, at the same time, whether connected or not, the postwar geopolitical system is breaking down and the economic stability of the Great Moderation has given way to the Great Recession and its aftermath of macroeconomic volatility. As the above chart shows, one very positive result of this messy process is likely to occur. 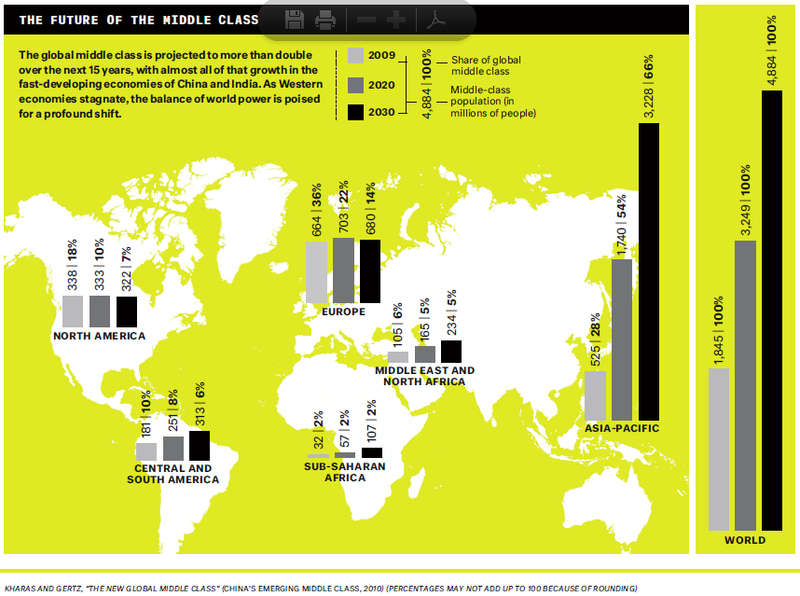 The middle class worldwide is predicted to grow from 1.8 billion in 2009 to 4.9 billion in 2030. All of this enormous growth in the size of the middle class will occur outside of North America and Europe. The implications for the continued prosperity and world leadership of the U.S. are clear. We need to get our own economy back on track, growing at a faster rate. We also need to get our fiscal house in order so that the dollar will continue to be the international currency of choice. Our dominant role in world affairs is beneficial to all but it is by no means assured without much effort on our part. This entry was posted in Chrystia Freeland, economic growth, globalization, income inequality, Jack Heidel, the Atlantic Magazine, world leadership and tagged economic growth, Economic inequality, fiscal responsibility, globalization, income inequality, jack heidel, world leadership by jackheidel. Bookmark the permalink.